I was recently lucky enough to be offered a chance to select a dress from PIOL, a new company offering made to measure dresses. PIOL lets you piece together your desired style, choose the fabric you want, and then uses your measurements to create the perfect dress just for you. The PIOL website is pretty spiffy–all pointy clicky–and you can see your dress take form as you are directed through an easy-to-use step-by-step creation process. The most difficult parts of the process? Actually committing to a design and getting your measurements right. So how did I do? I wanted to make sure I judged the dress on a fair playing ground plus I wanted a dress that I might wear to death and wear everywhere, so I chose a tailored silhouette, a moderate v-neck, a long pencil skirt, and cap sleeves. In black. But before you judge and shun me for not choosing one of their multitudes of great patterns, I just want to say that I thought black would be the best option for seeing the true lines of the dress. AND, I chose black matte stretch, which turned out to be a to-die-for fabric. 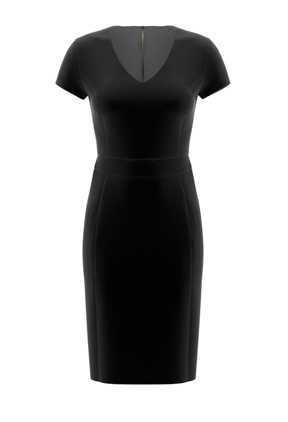 The dress is lovely and looks exactly as it’s shown on the site. The exposed stainless zipper. Which I know was all the style last year but it’s not a readily disclosed feature on the site (although I can sort of see it in the photo now) and it really destroyed the LBD demure dress image I had in mind. For my measurements, I measured and measured and measured again before submitting them. The bust size is spot on. Unfortunately the bust size fails to take into account my slightly broad shoulders and the fit isn’t quite perfect there. Also, I feel like I would take in the waist and hips in a future dress. It’s a little roomy. At maximum fatness, the dress would probably be fine but since I dropped a bit of weight since taking the measurements a few weeks ago, it’s not perfect. I probably should have cinched that measuring tape right up like a corset. Mea culpa. Completely. But I was also afraid of getting a dress I couldn’t slip on. Which would have been worse. So would I do it again? I’m not sure. I’ve got a lovely Tahari black dress that fits me quite nicely that cost a small fraction of the PIOL retail. But I DO have difficulty finding dresses that fit (I’m talking to you J. CREW!) and I am certain that I’d have the measurements completely dialed in the second time around. But the zipper was a real shocker and I would be super nervous about choosing a pattern without seeing it in real life. To its merit, PIOL does its best to minimize risk and does offer a very gracious return policy (all you are responsible is for the shipping costs both ways). So I guess I’m undecided (although I know I would be tempted) and I hope they work on a hidden zip option soon. This entry was posted in shopping, style and tagged dress, J. Crew, made to order, PIOL . A recent CareerBuilder survey makes the connection between colors and employers’ impressions of them. Over 2,000 hiring managers and human resources professionals from a variety of industries and company sizes were surveyed. Your worst choice? Orange. While it’s associated with “creative”, it’s also associated with “unprofessional”. This entry was posted in interview, shopping, style and tagged Ann Taylor, Banana Republic, blue, colors, J. Crew, jacket, Nordstrom, Rebecca Minkoff, suit, watch . I thought I’d give myself a small challenge today and see what it might take to suit up in pieces I might actually wear again. I decided that sale items were fair game if they weren’t one-of-a-kind close-outs, but I made sure that the pieces I put into my hypothetical shopping bag met a certain standard–they had to be versatile enough that I would mix them in with other things I might wear once hired and they had to be good quality pieces that would stand up to scrutiny (no unlined jackets, no trousers that wrinkle if you look at them wrong, nothing that looks like it might not last a day’s wear–nothing that would go to the back of the closet and stay there for good). What made the cut ? I started by finding a jacket I liked that had some matching pant options. LOFT was having a sale so I gravitated to this suit, knowing that they offer a good range of sizes and that the fit and finish would be very good. Once the jacket and pants were settled, I moved on to a top. Since the jacket is an open style, I wanted a color to punch up the outfit a bit, but I didn’t want to spend money on a colored silk or poly shell which I might move to the back of my closet. I like T’s under jackets. They’re versatile and cheap and truly the Target brands are great ones (there’s no need to premium dollar here). And then it was on to accessories. Timex makes a great classic watch. Since real pearls can be had at the same price or less than many women’s retailers, I chose real ones. I opted for a pair of classic black leather pumps–in a rather non-neckbreaking height. And then, a Zara tote that looks almost as good as it would in leather. This entry was posted in interview, shopping, style and tagged budget, challenge, interview, LOFT, Style & Co, suit, Target, Timex, Zara . It’s been a rough winter season for most of the US, but we’re just beginning to see rain here in California. Inclement weather can really throw a wrench in pulling together your interview look but if you have the right gear, you can still look polished. It’s fine to carry a coat and umbrella to your interview. Your coat should ideally be a trench style that fits over your suit jacket. Leave your bulky ski jackets at home. If you’re braving snow, slush, or salted sidewalks, it’s acceptable to carry a tote bag big enough to hold your boots, and change into interview shoes when you arrive at your destination but avoid a dramatic costume change in the lobby. This entry was posted in interview, shopping, style and tagged Banana Republic, Burberry, DKNY, J. Crew, Lulu Guinness, rain, snow, trench coat, umbrella, Vince Camuto, weather .